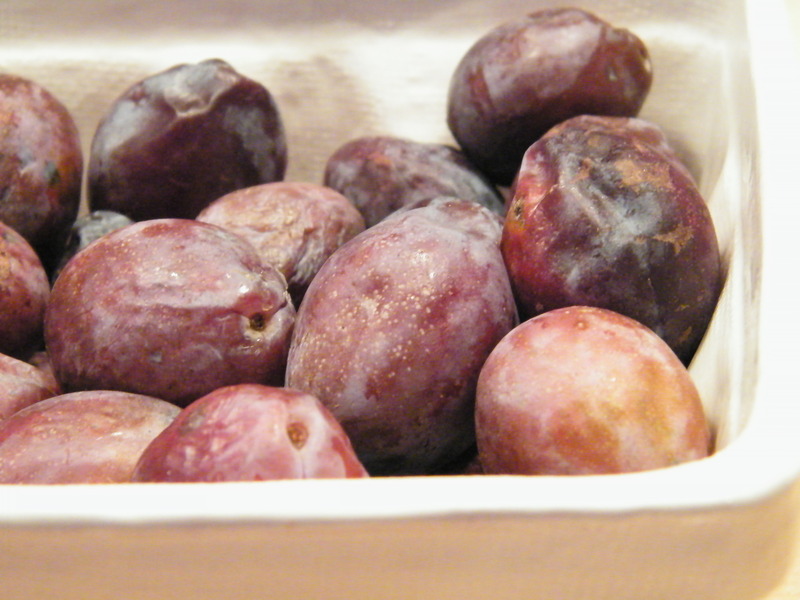 plum | What is That and How Do I Eat It? So cute! And they looked great for quick snacking. Unfortunately, though they were called French Sugar Plums, they weren’t very sweet, and the lack of juiciness was unexpectedly disappointing. They tasted so nondescript that I didn’t know how to respond – they weren’t bad, but that’s because they weren’t anything. 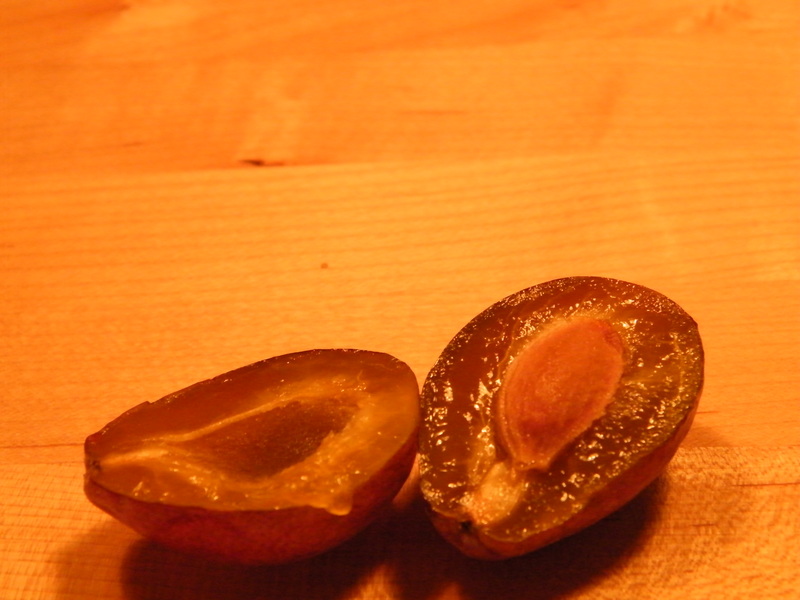 They didn’t even really taste like plums, just like they were some generically labelled Fruit. But because I’d bought a whole pound of them anticipating snacks to last us at least a week, I started surfing the Internet for how I could use them up. 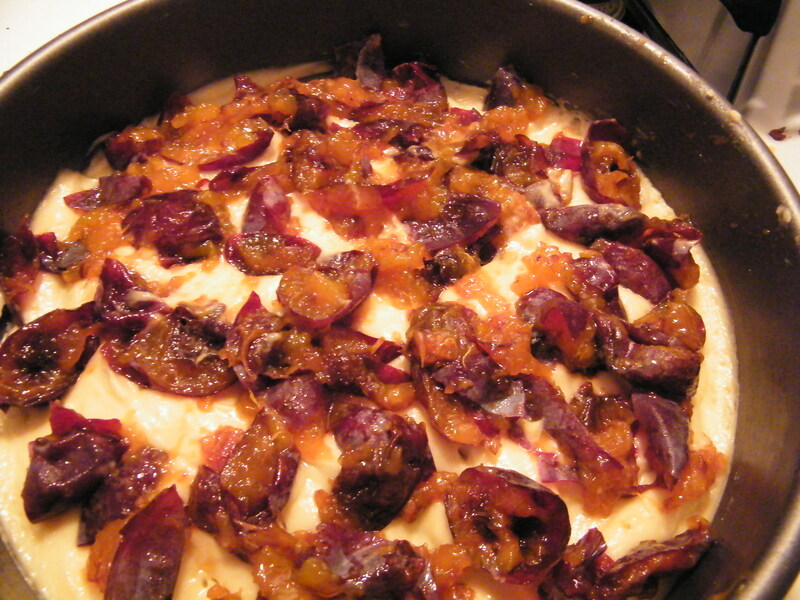 They’re also known as Italian Prune Plums, so there were suggestions for turning them into homemade prunes, but that seemed a lot of trouble for a food I didn’t really love anyway. And then I found The Cake. Apparently, I’m slow to a whole bunch of trains, because this recipe was published in the New York Times every year for about 20 years, but I only found out about it recently. But it’s what these plums were made for. Their tiny little oval shapes wink at you as the syrupy topping settles into the crevices left by their big, fat pits (you don’t see syrupy topping in the link? That’s ‘cuz I changed the recipe. Scroll down. ), and the heat of the oven transforms their blah generic flavor into something layered, complex, concentrated with sugar but not overwhelmingly sweet. In short? It’s the best coffee cake in the history of the universe. Toss with approximately 2 tsp sugar, 1 tsp cinnamon, splash of almond extract, and generous splash of liquor. Let sit while you make the batter. Mix flour, baking powder, salt and 1 tsp of cinnamon. Cream butter, yogurt and sugar and blend with well-beaten eggs. 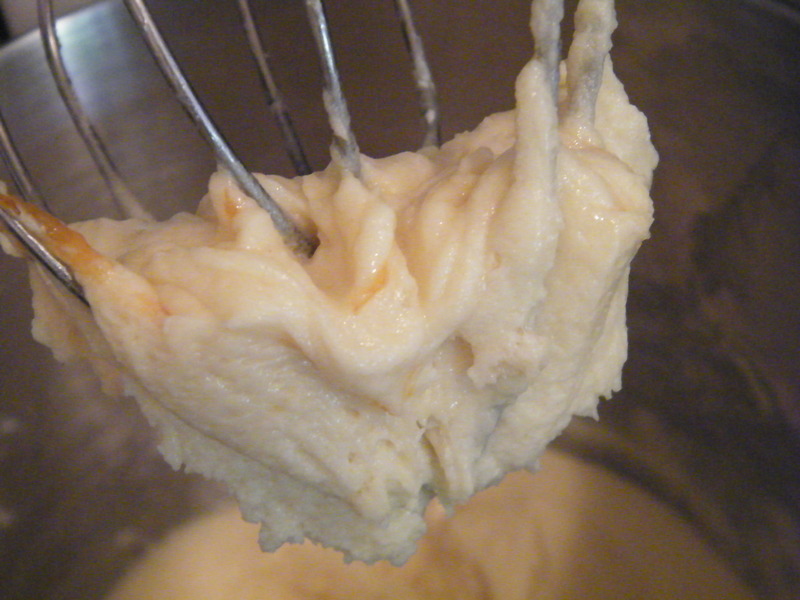 Add in flour mixture just until combined without flour streaks. Spread into the bottom of springform pan (it will be very thick). 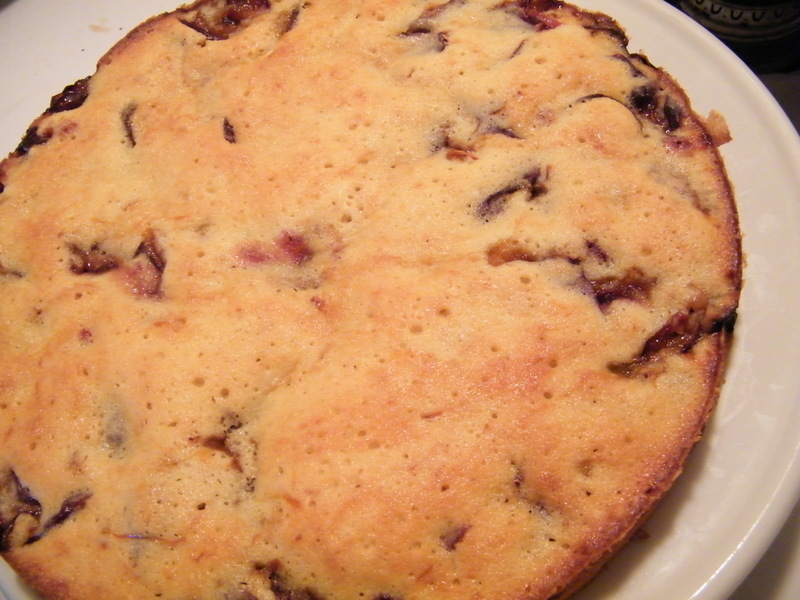 so flat sides of plums are level with batter. 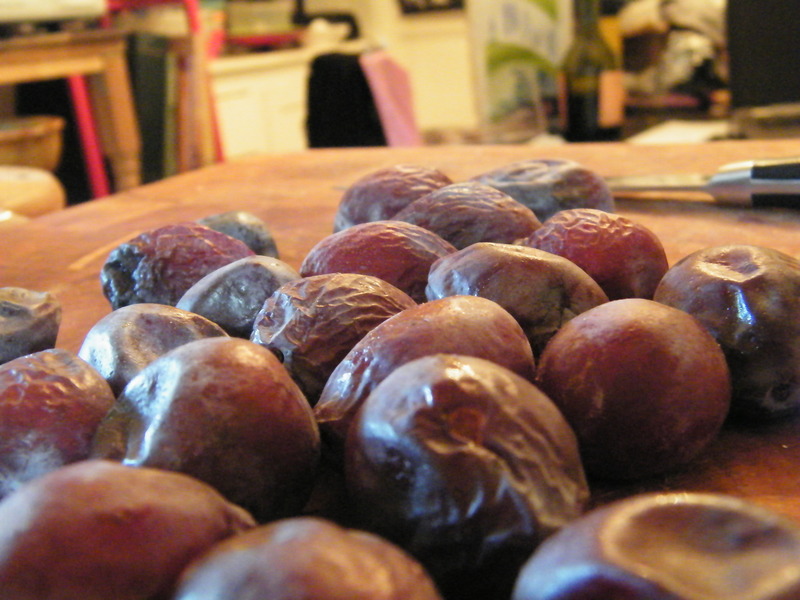 If your plums were overripe and fell apart while you were taking out the pit, that’s okay. It won’t look as glamorous, but will still look nice and taste just the same. Spoon remaining syrup in bowl over the top of the cake. Bake at 350 for 40-50 mins or until set in the center and pale golden. Separate the edges from the sides of the pan with a knife while the cake is still hot and let sit for about 5 more mins before removing the sides. Serve warm or room temperature. Look for small, oblong, slightly plump fruits. They should have a little bit of give when you squeeze them, but not be soft. Wrinkled skin means they’re on their way to prune-town; too soft means you’ll definitely need to cook them (but these should really be cooked when fresh for best flavor anyway, and if you’re making cake or sauce, the wrinkled ones will plump right up with a little liquid…) Small bruises and brown spots can be easily cut out; large scales are a bad sign. 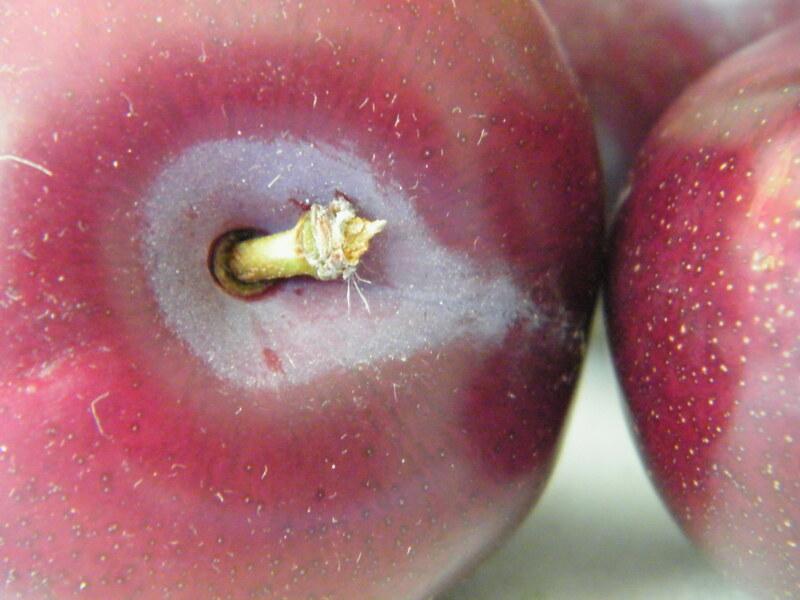 The fruit is too small to save when it gets a large blemish. 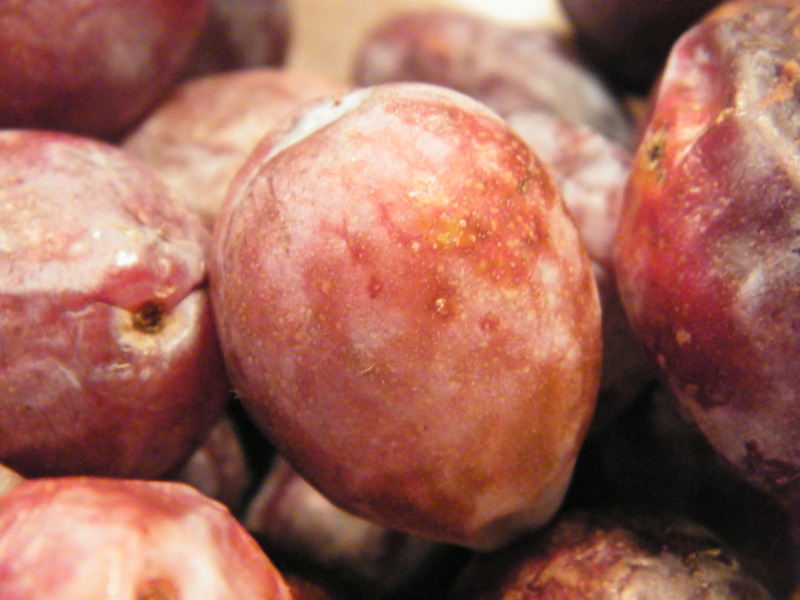 They don’t smell like much of anything when ripe -at most, a slightly acidic, plum-like scent. Edible seed? No. It’s a stone fruit. Less ripe plums will actually pop off the pit very nicely; as they start to overripen they will hang on, so stick with fruits a little on the firmer side if you want them to look pretty when pitted. Edible when raw? Yes. If you’re just eating them plain, let them ripen a little more so that you get the maximum juice possible. Worth the price of organic? Probably. 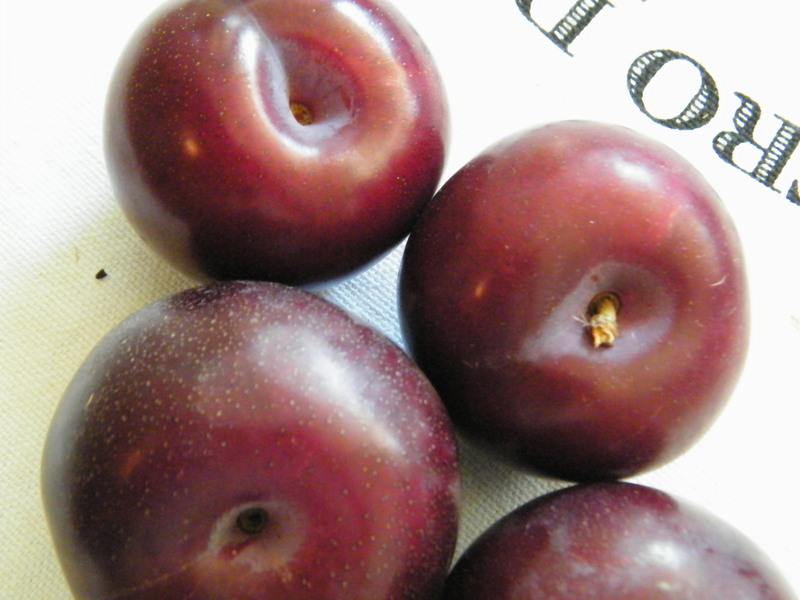 Imported plums are high on the lists for pesticide use, though domestic aren’t bad. If you don’t know where yours come from, I’d err for organic. If you know your farmer, you could probably get away with conventional. Best with: Heat. Cook them to concentrate the flavor and bring out the juices. 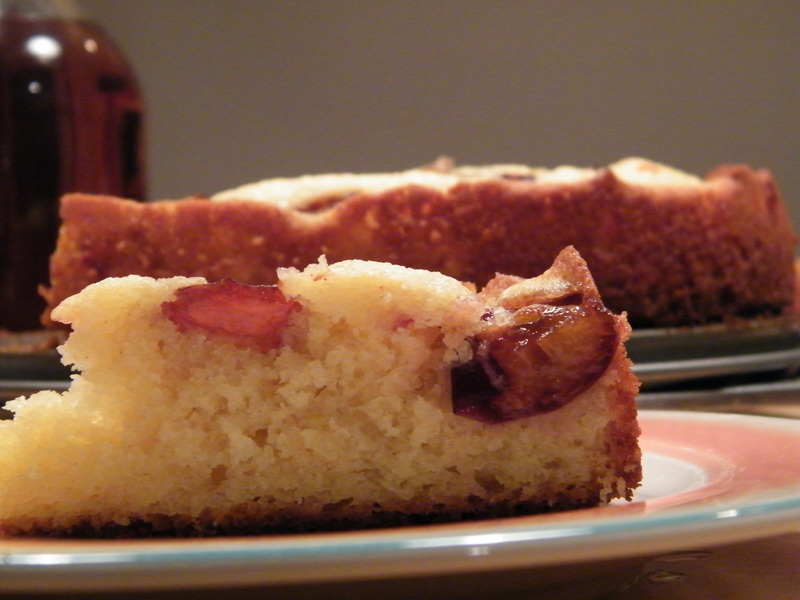 Otherwise, cinnamon, nutmeg, almond, vanilla, cream (and creamy substances – yogurt, sour cream, pudding, etc. ), and orange all go nicely for sweet uses. Because of their small size and subtler sweetness, they’re also ideal for use with dark meats or game, like chicken thighs, rabbit, lamb and duck. How to Store: In the fridge, they’ll keep as long as 2 weeks or more. If they start to shrivel and get prune-looking, they’re still great for baking though less tasty for eating raw. I’m a fruit fiend, frankly. Peaches, nectarines, plums, cherries…and don’t even let me near a basket of strawberries. Not if you want any, anyway. But when you’re trying out new stuff, fruit is pretty old hat. There may be 5000 varieties of peaches in existence, but when all is said and done, you eat it like a peach, amiright? Still, the number of varieties can be daunting. Take pluots, as I did at the market today. Pluots are a hybrid of plums and apricots that go a little heavier on the plum than the apricot, but within that description, there are a whole range of varieties, and each one tastes a little different. I very much like the ones that are often called Dinosaur Eggs or the other speckled varieties, but I haven’t seen those around just yet. Maybe they’re later bloomers. Pluot skin, of any variety, is a bit more speckled than plain old plums, but otherwise they really can look almost identical if you get the dark ones like I picked up today. Pluot skin is smooth like plums, not fuzzy like apricots, and until you get your favorites memorized – and even then, unless you know your farmer or something – pluots are one fruit that you absolutely HAVE to sample. 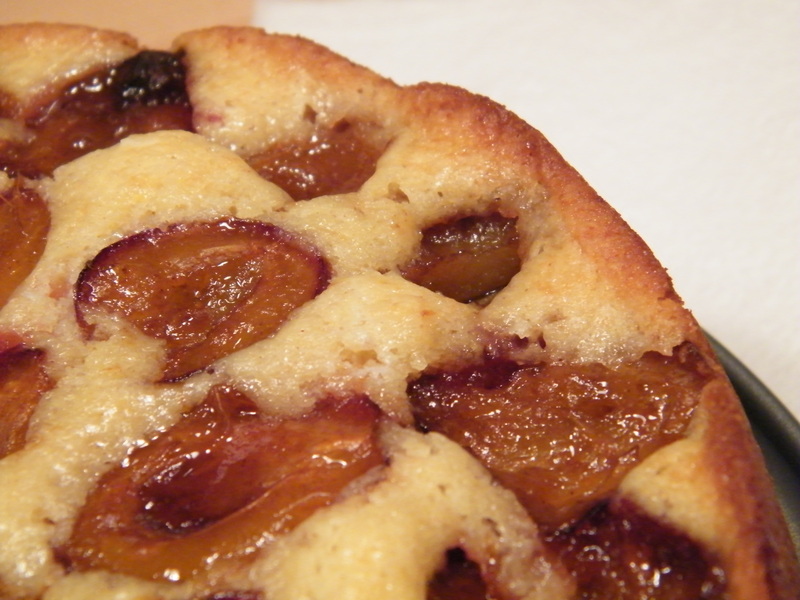 Pluots will always have a touch of sour, but they can also be very sour. Some of that depends on the ripeness of the fruit, of course, but I’ve found that a lot of it is varietal. These were listed as Santa Rosa Pluots, which I’ve not heard of before, but am assuming they’re hybridized off Santa Rosa Plums. They have a complex sweetness when ripe, with a tiny hint of sour, sort of the equivalent of really good plain yogurt. Let them get as ripe as you dare, almost too ripe, to get them as sweet and juicy as possible. A ripe pluot will have a small bit of give rather than be hard, but they don’t smell very floral the way peaches or apricots do, and they only get quite soft when they’re almost overdone, so ask if you’re not quite sure how ripe yours are. 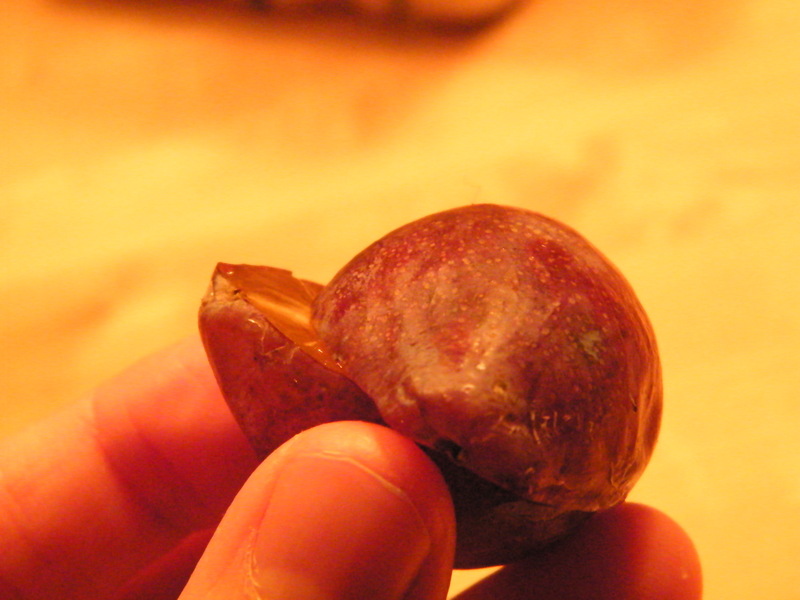 Since a lot of pluots have greenish skin, hints of green near the stem aren’t a good indicator. 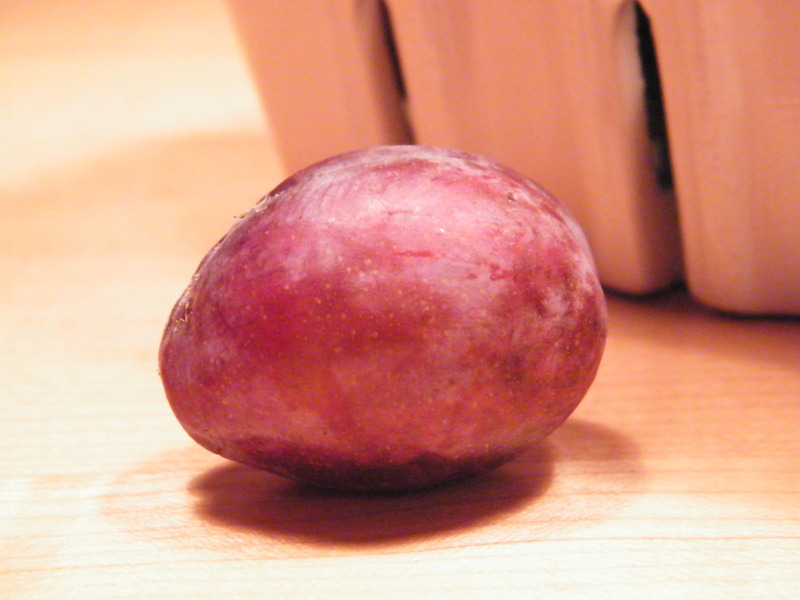 Pluot meat can be anywhere from yellowish to almost purple, sometimes even greenish-purple, though if it’s greenish on the inside that usually means it’s not ripe. 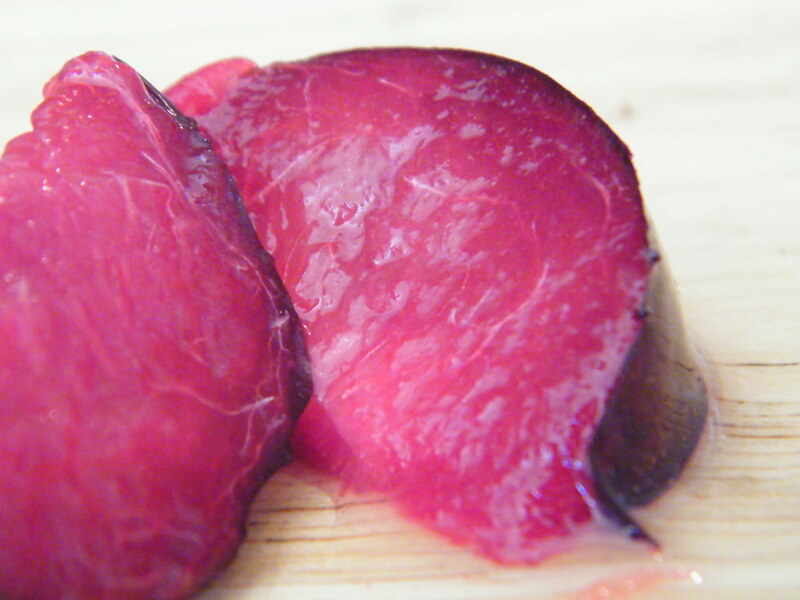 Otherwise, the variety is as endless as, well, the varieties of pluots. 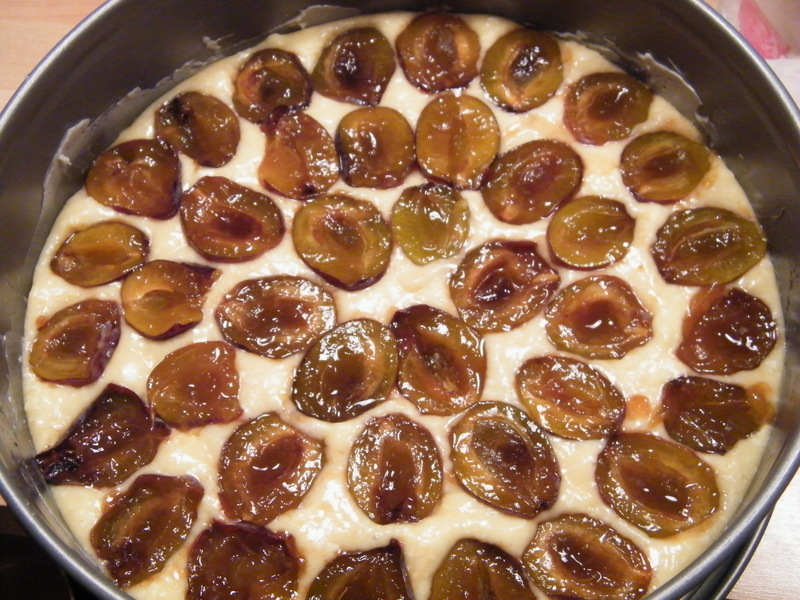 Because of their complexity of flavor, I prefer to eat pluots straight up (unlike every other stone fruit, which I prefer to bake into innumerable delicious items that all go great with ice cream…). If they do get too ripe, or if they are far too sour, saute with a little cinnamon and eat as a saucy dessert. If they’re too sour, add a little sugar to the mix, and you can always add a little butter, but when they’re simply overly ripe they really don’t need it. 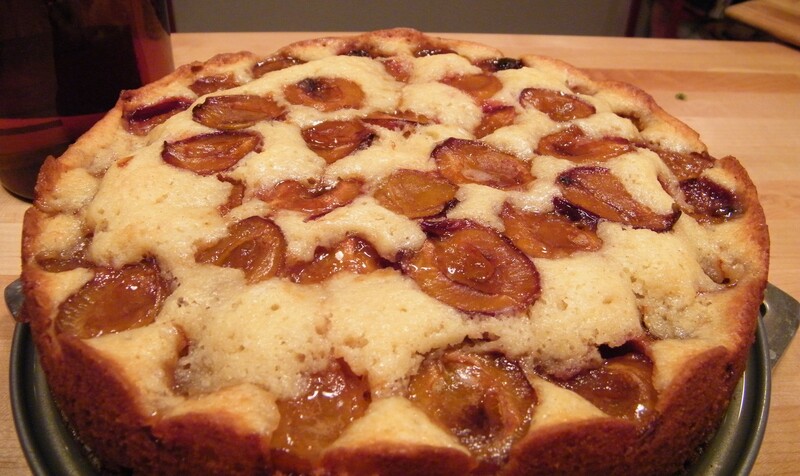 If you have any recipes in which pluots really shine, post below! Peel? Nope. 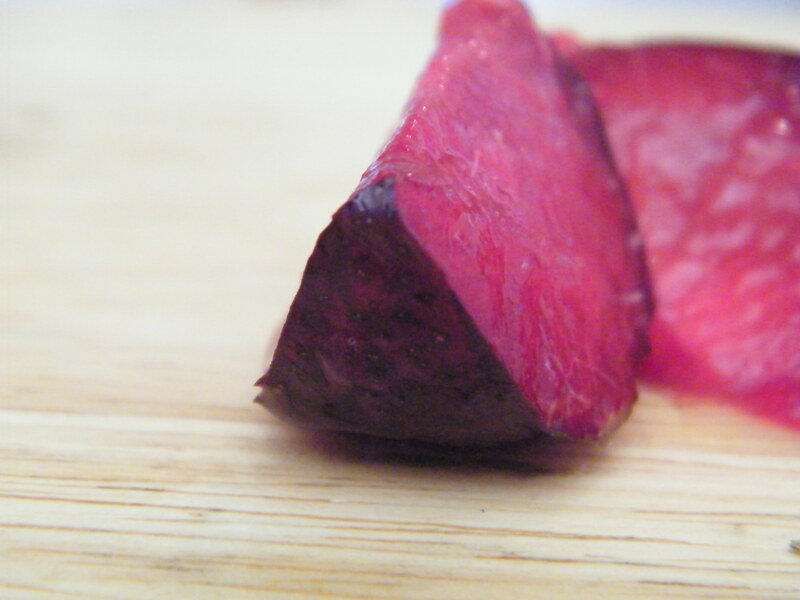 The skin is delicious – a little sharp around the edges, a little bit of chew like apple peels, but perfectly lovely. Edible seed? No. It’s a stone fruit. This variety at least, is not a freestone, which means a lot of peach meat will hang on to the pit – another reason to just eat it straight up. Edible when raw? Definitely. Wait until ripe. Worth the price of organic? The consensus is yes. Stone fruits are notoriously hard to grow, which means if someone’s growing them conventionally, they’re likely loading up on all sorts of chemicals to keep all the enemies at bay. While pluots aren’t specifically listed on most “Must Buy Organic” lists, plums are high on the list, and since you’re eating the skin usually, I’d err on organic all the way. Best with: A sunny day and a napkin. How to Store: Ripen on the counter, in a paper bag to speed the process. Store on the counter if you plan on eating soon; put them in the fridge if you want them to keep a few days longer. Once ripe, they’ll keep on the counter about 2 days, in the fridge maybe as many as 4, but that’s pushing it.